Dr. John Offerle has been providing professional eye care to families of the Michiana area since 1979, and offers comprehensive eye examinations, contact lens fittings, and advanced eye health and optical services for all ages. 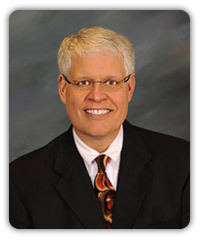 In 2010, he was awarded Optometrist of the Year by the Indiana Optometric Association. It is the association's highest honor and was given to Dr. Offerle for his dedication to his patients, volunteerism, and service to his profession. In 1989, he was the recipient of the President's Citation from the Indiana Optometric Association. Dr. Offerle is certified by the International Association of Boards in the Treatment and Management of Ocular Disease, and is a certified eye enucleator for the Indiana Lions Eye Bank. He has served as Optometric Consultant to Healthwin Hospital, Indiana State Prison in Michigan City, and Westville Correctional Center in Westville, and is currently Optometric Consultant to Our Lady of Angels – Saint Francis Convent. Dr. Offerle annually travels overseas on VOSH (volunteer optometric service to humanity) mission trips to donate his professional services, and to distribute eyewear collected through the Indiana Lions Clubs. He has made several trips to Honduras, and most recently traveled to Kenya, Africa. Dr. Offerle also volunteers his services at St. Joseph Regional Medical Center at the Chapin Street Clinic in South Bend, and at area schools to provide free vision screenings. After completing his undergraduate degree at Indiana University in Bloomington, Dr. Offerle attended Indiana University School of Optometry where he received his Doctor of Optometry. While at the university, he was a member of Omega Epsilon Phi Optometric Fraternity. Through further study and examinations, Dr. Offerle earned the distinction of Fellow of the American Academy of Optometry (FAAO). He frequently attends continuing education conferences to keep abreast of the latest developments in professional eye care. Professional memberships and affiliations include the American Optometric Association where he is a charter member of the Contact Lens Section; past presidencies for the Indiana Chapter of the American Academy of Optometry, North Central Optometric Society, Indiana Optometric Association, and River Park Lions Club; Legislative Chairman for the North Central Optometric Society, and former member of the Board of Trustees of the Indiana Optometric Association; and past Indiana Chairman of the Vision USA program, which provides eye care services to low-income Hoosiers. When he is not caring for patients, he enjoys traveling with his wife Laurie, a clinical social worker and therapist for Lincoln Therapeutic Partnership. Laurie, born in Portage, attended Indiana University and received her master's degree in social work. Dr. Offerle graduated from Fort Wayne Bishop Dwenger High School. He and Laurie reside in South Bend and have two grown daughters – Kyle and Dr. Kristina Offerle, who also practices at Eye Care Associates of Michiana.